To help others trust God by making awesome Christian music easy to find. Wherever possible, we want to promote the original artists as well. If you'd like us to feature some awesome music, let us know. If you are an artist – or if you represent an artist – and want videos, links, or lyrics removed or changed, contact us. Why are some artists included, or not included, on ACM? The music here is awesome, but it's not simply entertainment. Each song is chosen for its content. We are Jesus-followers. We're convinced that Christianity is true, and that our personal relationship with God makes every part of our lives better, more fulfilling, more...awesome. We want others to learn about Jesus, and to trust God with their lives. Music is a great way to communicate those things. The artists featured here have purposefully created Christian music. Not every song here is about Jesus, but every song will, we trust, help someone grow in their relationship with God. On the flip side, many artists who are Christians do not purposefully produce Christian music. They are our brothers and sisters in Christ, and we wish them well...but their music is outside the scope of this project. Our goal is to make Jesus better-known by promoting music that purposefully makes Him better-known. We're big fans of Christian music...since the late 1970's. Some of our early influences included artists like Petra, Brown Bannister, Larnelle Harris, Sweet Comfort Band, and Steve Taylor. In 2001, search engines weren't very good at finding the websites of Christian artists, so we started adding their links to our personal blog. What started as a quick list soon became a project of its own, and we moved those links to their own website, CCM Links. 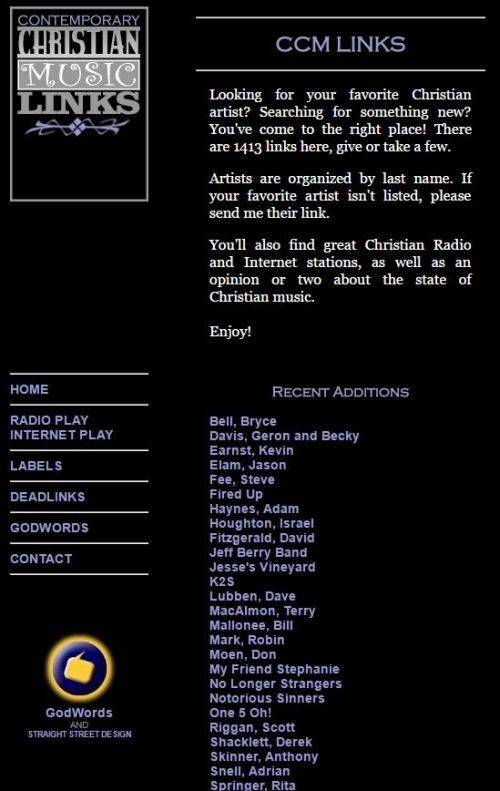 Links to Christian radio stations in the U.S. were added, along with links to record labels. Eventually, the website became both a database of links and a blog, featuring free mp3's offered by each artist. 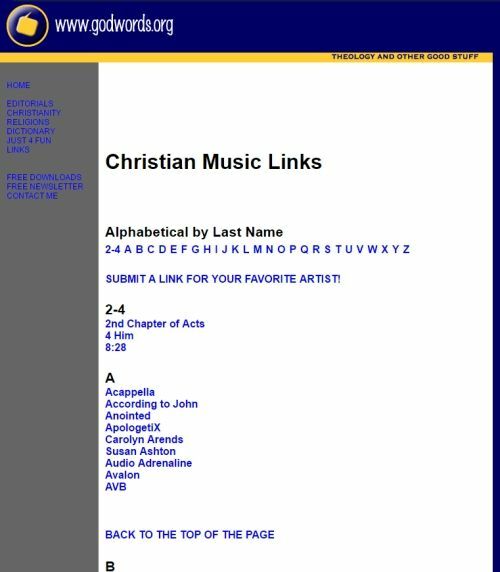 By 2011, we had inadvertently created the internet's largest list of links to the Christian music industry. Our goal was not to be famous (we weren't) but to promote Christian music, and Christian musicians. Because the music had taught us so much and helped us mature in our faith, we wanted to share the music with the world. Technology, though, eventually caught up with us. Search engines had finally gotten very good at finding websites, and we felt there was no longer a need for CCM Links. After a few years, we missed it all. With the rise of social media, it became clear that curating content and sharing it made up the next wave of internet ministry tools. We could share Christian videos on Facebook and Twitter, but our audience was limited. Having been freelance web workers since 1999, it seemed obvious that we could again make a small impact by sharing Christian music here at Awesome Christian Music. The goal is the same: to share with the world the same music that has helped us, grown us, and entertained us for decades. We hope you like it...not for our sake, but for yours.